Grace and Ricardo are a couple from Seoul, Korea. Yes.., we know, Ricardo is not a typical asian name, but this charming guy spent 5 years living in Madrid in order to learn classical guitar. As expected, he promptly fell in love with Spain, and took advantage during that time to explore every corner of the country. Meeting locals and involving himself with the spanish culture. This love for Spain ended up by baptizing himself and picking the name of Ricardo. After years living in Korea, he and her couple planned to get marry in 2015, so they decided to get before a photoshoot as a prewedding in a special place. Their decision was clear, Sevilla was the perfect candidate. They arrived to Seville in Christmas time, having the chance to see the city decorated with easter flowers and bright lights. So we started our PreWedding Photo Tour in magic Santa Cruz Neighborhood, the best place for a couple in love. Against all odds, there was no sun in Seville that day. It was cold and cloudy, but that was not a barrier to Grace to exhibit her brand new white-bride-dress. Indeed, it was a perfect day for taking photos due to the white and soft light comming from the clouds. So we started taking the first snapshots of the couple. Ricardo was not a fan of photos, but he was striving for looking good as he knew the photoshoot was very important to Grace. We enjoyed discovering mystical Barrio Santa Cruz with its secrets spots. As time went by, Ricardo and Grace got more confident in front of the camera. It was their first time as models and they were doing right! We ended up our Photo Tour by going to the balcony of their hotel, which had beautiful views of the Cathedral. We could take great photos of Grace with the Giralda as a background. We said goodbay each other and wishing all the luck of the world. 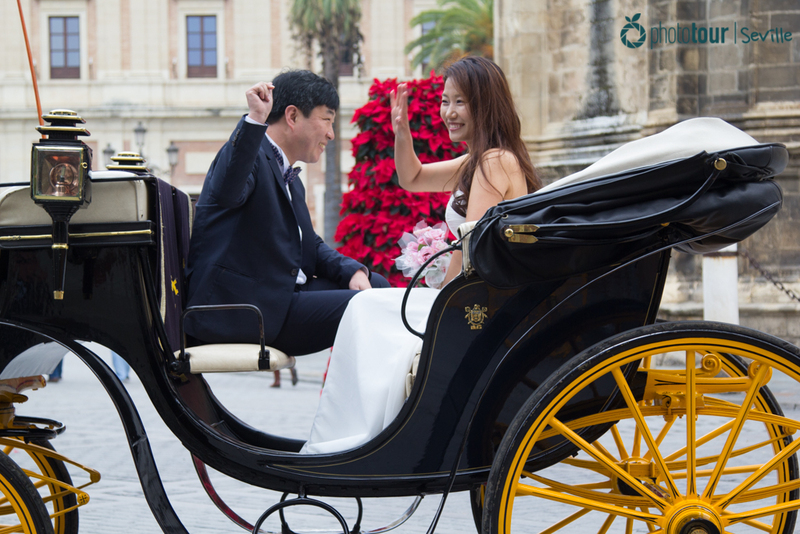 We really hope Ricardo and Grace be happy with their lifes and wish to see them again either in Seville or Seoul! Book your Personalized Tour by clicking here!